The Great Strahov Stadium (Velký strahovský stadion in Czech) is a stadium in the Strahov district of Prague, Czech Republic. It was the largest stadium in the world and is the second largest sports facility worldwide after the Indianapolis Motor Speedway, seating around 220,000. Construction began on a wooden stadium in 1926, and was replaced by concrete grandstands in 1932. Further construction occurred in 1948 and 1975. The playing field, surrounded by seating on all sides, is 63,500 square metres. 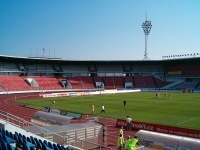 Contemporarily the stadium serves to Sparta Prague as a training centre with 8 football pitches (6 pitches of standard sizes and 2 futsal pitches). The stadium is sited on a prominent hill overlooking the old city. It can be accessed by taking the funicular up the hill through the gardens. The original stadium dates from the First Republic between the World Wars and served as a venue for Sokol displays of synchronized gymnastics on a massive scale. It was later used for large displays during the communist era. Performances with several hundred gymnasts making various complex formations and exercising identically while accompanied by tunes from traditional folk music attracted the attention of many visitors. Each time, among the widely popular shows were those of young well-trained recruits who wore only boxer shorts while on the display or women dancing in miniskirts. The groups of gymnasts (unlike the soldiers who were ordered to practise and participate) were put together from keen local Sokol athletic association members who regularly trained for the show throughout the year prior to the event, which repeated every five years. The ambiguous name of the performance, Spartakiáda, referred to quondam power and strength of once uprising slaves led by Spartacus. 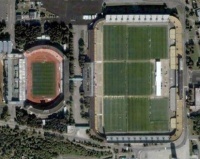 Now (except for Sparta Prague’s training ground) the stadium is used for holding huge concerts. Bands that have played there include Pink Floyd, The Rolling Stones, U2 and Genesis. On August 18, 1990, Strahov Stadium housed a Rolling Stones concert with more than 150,000 people in attendance, including president Václav Havel. The future of the stadium looks at adaptive reuse and preservation of this unique structure. There are plans to convert the mammoth Strahov stadium complex into a commercial zone complete with hotels, restaurants and shops. Another suggestion is to turn the area into a leisure mecca for the 21st century. There are also plans to rebuild the area as an Olympic village if Prague wins a future olympic bid.